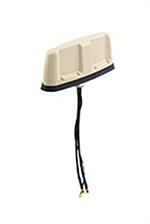 The SkyCompass Rhino dual LTE antenna provides optimal 4G LTE coverage in a single, low profile housing. The antenna also incorporates PCTEL’s unique SkyLink™ high rejection GPS/GLONASS technology for optimal performance and support of carrier voice and data networks. Glass reinforced polycarbonate housing and heavy duty metal base plate makes this antenna extremely rugged and ideal for heavy equipment applications susceptible to high shock impact, including mining, agriculture, construction and defense vehicles.